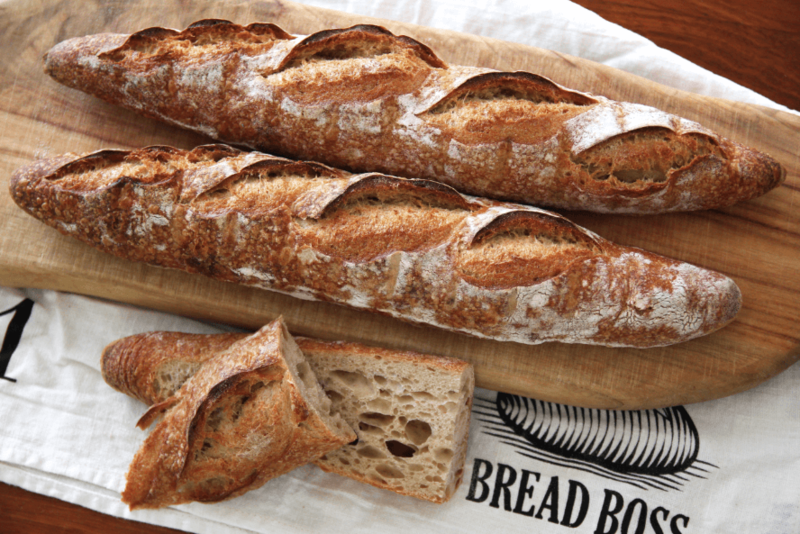 Learn how to make these crusty, mouth-watering sourdough baguettes. Their complex flavour and beautiful taste come from the long fermentation and retardation time (time in the fridge), 100% hydration of the sourdough and a little bit of stoneground and fava bean flour. These baguettes are quite small so that they fit into the domestic oven but they are delicious. Best eaten fresh from the oven. One of the flours in the recipe is fava bean flour but we ended up using fava and garbanzo flour as this was the only one available in our local health-food store. This recipe requires a dough temperature for the final dough of 20°C (68°F), we used a method outlined in this post to ensure this. How to make a sourdough. 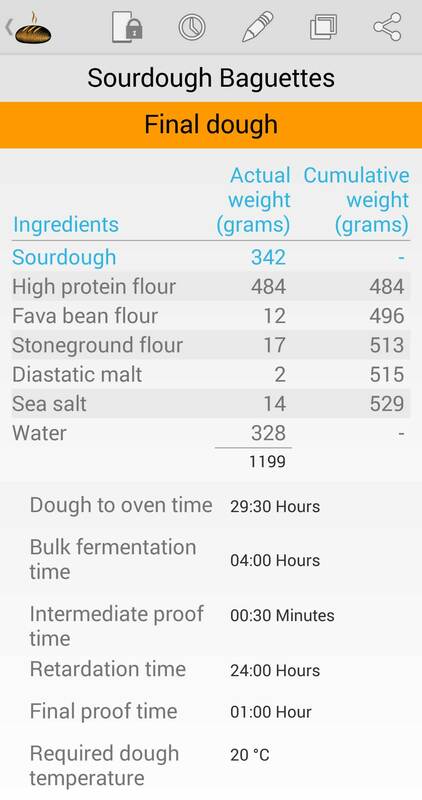 The sourdough created in this stage will be 26g (0.905oz) more than is required in the bread dough. This amount will be removed from the sourdough stage before adding it to the bread dough and will be your starter for the next time you bake. Baking Temperature and Time Preheat oven to 250°C (482°F) and bake for 20-25 mins turning around after 10 mins. The video gives you a good idea of how to mix the final dough, mould and add to the tray to store in the fridge over night and then bake off. Weigh and add flours to mixing bowl. Weigh salt and leave to one side. 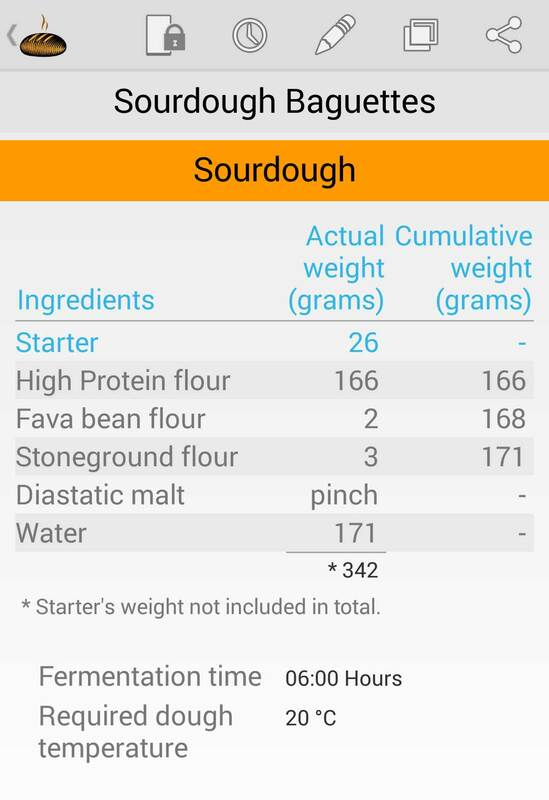 Remove starter weight from sourdough and store in fridge as your next starter. Weigh water and add to the bowl. Mix ingredients together and add more water if necessary to achieve a soft dough. Tip onto bench and knead gently for a 5 minutes. Leave covered dough to rest for 15 mins. Knead for 10 mins, cover and leave to rest for 15 mins. Add salt and knead until salt is dissolved. Place dough back in to the oiled container and cover for the bulk fermentation time of 4 hours. Dust bench with a generous amount of flour and scale dough into 200g (7.054oz) pieces shaped as a baton. Leave to ferment for the intermediate proof time of 30 mins. Shape and roll out into baguette shapes and place on a tea towel on a wire tray. Then cover with a tea towel and place in fridge overnight. Remove from fridge and leave to ferment for the final proof time of 1 hour. Once they are ready for the oven, place the dough on the peel, slash them and load them onto the oven stone and bake for 20-25 mins turning half way through. Saturday 7pm Mould and roll as a baguette. Place on a wire rack on an oven tray covered with a tea towel. Leave in the fridge over night. Sunday 8am Remove loaves 1 to 3 from fridge. Sunday 9am Bake loaves 1 to 3 for 20-25 mins turning around half way through. Sunday 10.15am Remove loaves 4 to 6 from fridge. Sunday 11.15am Bake loaves 4 to 6 for 20-25 mins turning around half way through. For the good oil on slashing, don’t forget to read this POST. tried kneading wet dough for 10 min-no success-ended up with gloopy hands. Used all ingredients said. Wetter dough is harder to handle for sure and “gloopy hands” sometimes comes with the territory. Try folding the dough instead of “kneading”. Spend 5 minutes of folding then 10 min of resting – but keep it covered – and then again 5 min of folding, resting etc. How many times will depend on how well you execute clearly defined folds. You can tell if you’re getting the desired effect by how the dough begins to change in feel and character. However, rest in a tub and then careful folding will help it to begin forming glutenous bonding which makes it not only easier to handle but ensures it will be riper and conditioned when it enters the oven. I assume you’re early on in this journey perhaps you could reduce the water content a little to a more manageable hydration. Then as you gain more experience you could slowly increase the hydration level. But it gets better as you gain experience. Just thinking of a few more things you would benefit from. I forgot to mention that water added could be in two phases which helps to provide a more manageable dough. First amount could be 70% water then after the second round of folding or rest add the balance. This will help you manage the dough a little better. Although when incorporating the balance of the water the dough will exhibit that “gloopy” feel until it is thoroughly mixed in. Good luck and let me know how it goes. If I can get the time I’ll make a video showing folding with wet dough.